Dropped metatarsal (also known as plantarflexed metatarsal head or displaced metatarsal head): Each foot has five metatarsals that connect to one of our five toes. The metatarsals sit in a precise relationship, one to the other, forming the metatarsal arch (also called the transverse arch). 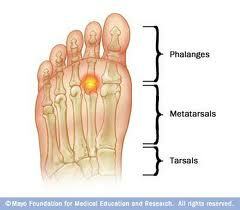 As we step down on the ball of the foot, the metatarsal arch begins to flatten in response to our body weight. This allows the ball of the foot to function as a shock absorber. If one or more of the metatarsal heads sits lower than the other heads, it will bear a greater amount of our body's weight than it should. After time, the dropped metatarsal head becomes "beaten up" from all of the extra or abnormal weight it is carrying, and it becomes inflamed and painful. Also, because the metatarsal head has "dropped," it is sitting closer to the skin on the bottom of the foot, and it pushes its protective fat pad away, so that you may actually feel the protruding metatarsal head with your finger. A flexible foot. In this type of foot the ligaments, tendons, and muscles are too lax to allow them to hold the bones and joints together in their most optimum alignment. The most common cause of a flexible foot is a biomechanical defect known as pronation. High heeled shoes. When the heel is raised, our weight is thrown forward onto the ball of the foot. This increased weight stretches the soft tissues that maintain the metatarsal arch, allowing one or more of the metatarsal heads to drop. Injuries to the ball of the foot. When fractured metatarsals or dislocated joints are not properly treated, they may heal in an abnormal position, allowing the metatarsal head to drop. Dr. Michael Horowitz offers a 5-Step process to successfully treating Dropped Metatarsals. He can help evaluate & diagnose your condition and recommend the best course of action for you. Call Vancouver Orthotics at 604-737-3668 for more information. What is the most effective treatment for dropped metatarsals? What exercises & stretches do you recommend for dropped metatarsals? What other symptoms are most commonly associated with dropped metatarsals? What shoes are best for dropped metatarsals? Where can I get medical hardware for dropped metatarsals?